Recommended for use on tinted, bleached or relaxed hair. 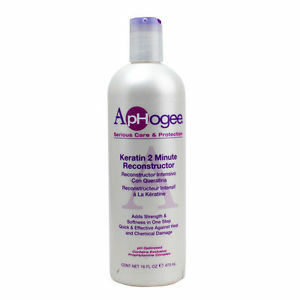 ApHogee Keratin 2 Minute Re constructor helps repair damage caused by chlorine and hard water. Soothes irritated scalp and may be applied following each shampooing until the healthy condition of the hair is restored. Recommended for weekly use until hair feels and appears healthy again OR after every chemical service/ RELAXER TREATMENT.